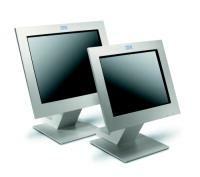 The IBM 4820 10″ Display Model 1FR is a display only monitor that has the same features, performance and video interface as the Model 10D, but is designed to attach to an IBM SurePOS 300, 500, or 600 system unit. The display’s IBM Iron Gray color is color-matched with other I/O devices that attach to these POS system units. It attaches via the industry-standard analog video port on these systems.